This is for you to decide what you’d like. Perhaps you’ve seen something you like, but you’d like it tweaked. Perhaps you like something on the website but you’d like it in a different colour, or with a different charm? Perhaps you’ve got an idea but don’t know where to find it? You’ve looked through the photos on this website and you know the style I make. Now it’s up to you to let me know what it is. Write me a note and send photos if necessary. 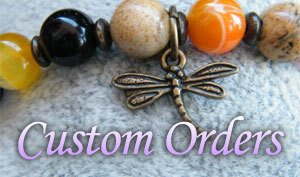 I’ll get back to you with your custom order and double check your requirements along the way. This is something close to my heart and the core of Patheya Jewels. I design healing yoga/chakra jewellery especially for your needs. You do not have to know about chakras to ask for one of these bracelets. I offer this service with a free 15 minute skype session to talk about your needs. If this is not suitable for you, then feel free to drop me an email with what you’d like support with. This jewellery is perfect for you if you want to wear something that symbolises the internal workings of the mind and spirit. My intention is to combine my years as a yoga teacher and chakra course leader into my design and produce the most helpful piece for your spiritual and physical health. Designs for bracelets cost about 20 to 25 euros and include consultation via email or skype and yes, you definitely get a say in the colours, size and style. Designs for necklaces cost between 25 and 50 euros and include consultation via email or skype and yes again, you will definitely get a say in what it looks like. Designs for Prayer Beads cost from 45 euros up to 100. These require extra attention to detail as they are for meditation and ideally part of your spiritual practice. I may ask you to allow me to publish your inspired piece as one of my online in stock products. The prices are relative to the materials used, the time it takes to make and the level of difficulty in creating the piece. I’ll offer a quote when you contact me.